Fans of reality TV shows might recognize Hyde Hall as being a huge “Before & Afer” makeover project. Soon Hyde Hall will be the scene of yet another episode: the transformation of the Dining Room walls. 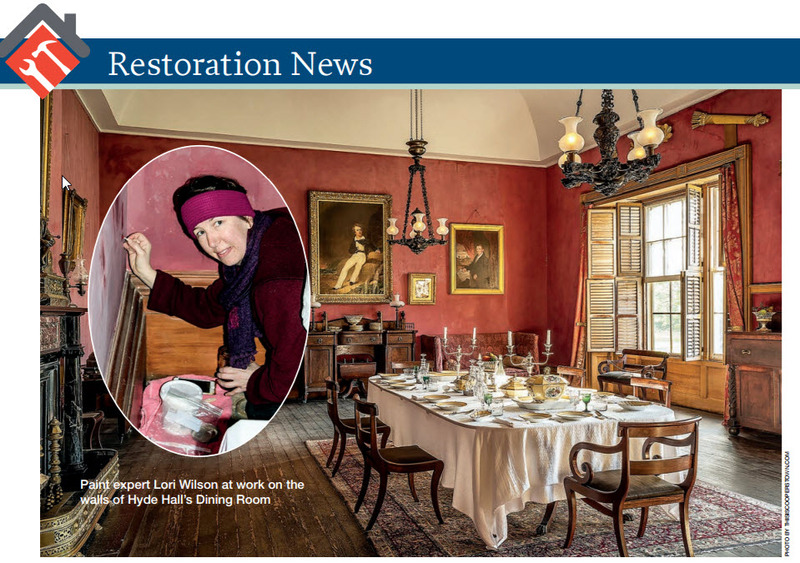 We have asked Lori Wilson, internationally known paint expert, artist, teacher, and master painter, to restore the Dining Room walls to their 1830s appearance. Long associated with Golden Artist Colors of New Berlin, New York, Lori brings many years of experience to Hyde Hall. Her goal will be to reproduce in the Dining Room the same marbleized treatment that has survived in the Drawing Room and Entrance Hall. In the 1880s, the Dining Room walls were painted a once-fashionable Victorian red, but with restorations now focused on recreating the earliest appearance of the Great House, these three major rooms will soon present the unified ensemble that George Clarke created in 1833. While painting a room might seem simple, the Dining Room project has posed interesting challenges. The first task was to test the Dining Room wall surface to determine what course to follow in the restoration of the original color. Lori discovered that the red pigment is very difficult to remove, and in the areas she tested, the pigment was deeply absorbed into the plaster walls—all the way down to the second or brown coat layer. Based on this discovery, she believes the red pigment will not bleed through the new thin skin of limewash that she would like to spread over the surface of the Dining Room walls. Not having to remove all of the red paint (a time-consuming and difficult process) is a major advantage. It is interesting to note that the limewash she plans to use will contain mica and black pigmentation similar to the original surface. To avoid the possibility of bleed-through or delamination, Lori recommends that we test select areas in the Dining Room with different surface treatments over the fall, winter, and spring seasons. The goal is to choose a durable new finish treatment that will adhere to the present surface. This means we must delay the Dining Room carpet installation until May or early June of 2017. It is a small price to pay for better results. We are grateful for the care and thoroughness of Lori Wilson’s analysis. We hope you will visit us next May during tours to see her at work recreating the marbleized surfaces that make Hyde Hall a model of 1830s elegance and sophistication.